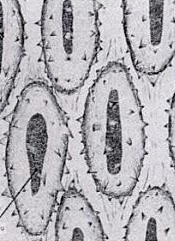 Cells of the proventriculus of Galleria mellonella showing “thorns” that project into the food canal. This, week I have been posting about variety in the proventriculus of insects. In caterpillars, the length of the foregut is variable. In continuous feeders such as hornworms, the foregut is short. Caterpillars that feed discontinuously may have longer foreguts. Among caterpillars, the proventriculus has been the most thoroughly investigated in the wax moth, Galleria mellonella. These larvae live inside bee hives and feed on wax and other nutrients. The proventriculus consists of 260 to 300 cells that secrete the cuticular lining. These cells are polyploid and increase in size from third to final instar. Third instar larvae have proventriculus cells about 34 square microns. In final instar larvae the cells can reach over 1 square millimeter. The cuticle of the proventriculus is sclerotized and has projections called “thorns”. The thorns near the inlet of the proventriculus point toward the midgut and are long enough to extend into the midgut. These thorns could prevent retrograde movement of food particles in the foregut. In the middle and near the outlet of the proventriculus, the thorns are shorter. As the cells become larger, the numbers of thorns increase, but become slightly less dense. Their size does not change appreciably. The proventriculus is surrounded by muscle which can move the thorns in a grinding action. The cells of the caterpillar proventriculus disintegrate when the caterpillar molts to a pupa. *Bittner, A. 1954. Untersuchungen uber den Proventric- ulus der grossen Wachsmotte, Galleria mellonella. Wissensch. Zeitschr. Univ. Greifswald 3:519-531. This entry was posted in by jjneal, Caterpillar Blogging, Taxonomy. Bookmark the permalink.